Is there a reason that Infernape's and Emboar's body art look similar? There's not really a reason (other than Game Freak getting lazy), and probably wasn't intended to look that way, but they are sort of similar; you could say that. The colors are certainly similar, so I can see why you'd think that. Do keep in mind though this happens a lot; back when we didn't know much about Unova's new Pokemon, many of us believed that Alomomola was an evolution on the pathetic Luvdisc. Only game freak knows why. They made it like that..... maybe they are cousins. Write a letter to game freak or something... I doubt they will reply. 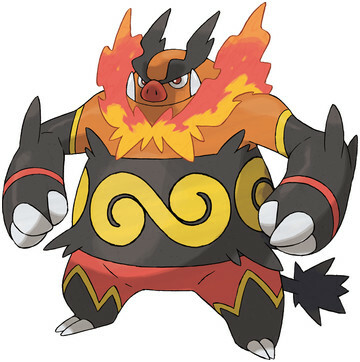 no i mean look at the body art on infernape's ribs and emboar's stomach. don't they look the same to you? Oh, you mean those swirly yellow things? yea. not to sound rude or ungrateful but it seems like game freak and the pokemon company kinda got lazy on the fifth generation fire starter. 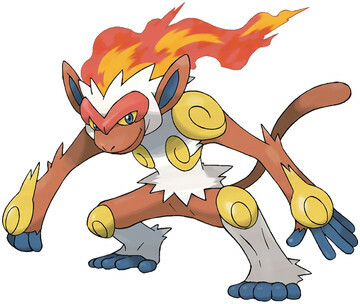 but if i can pick favorites, i would choose infernape over emboar any day of the week. How could you take infernape over emboar? Emboar has higher stats than infernape. Is there another look of the Ken Sugimari's artwork of the Pokemon? Will Assist + Punching Moves work as a party with Infernape's Iron Fist? How did my Infernape's stats get lower? Why is the official artwork for Mega Alakazam shiny? Where can I find the official artwork of Red from HeartGold SoulSilver? I've used items that add points but it's not working. whats wrong?This might help emboar is level 51?